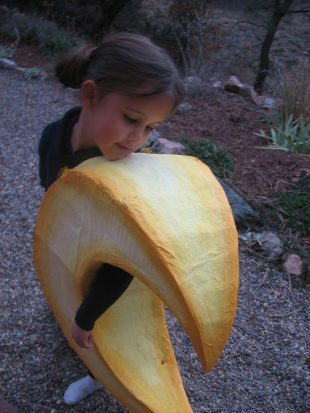 This year for Halloween my 4 year old daughter said she wanted to be “La Luna” (the moon!). Since she was able to talk, she has always called the moon “La Luna, My Friend”. She has had a loving relationship with Her Friend and always looks out for her on any given night sky. So, of course, I willingly agreed to make Her Friend, without much thought as to how in the world to actually pull this off. As October approached, I started to think about the logistics of this endeavor. I thought paper mache would work because it is rigid. Fabric didn’t seem like the right fit for this project. Paper mache comes from the French word “papier mache” which literally translates as “chewed paper”. Paper mache was historically used to make coffins and death masks in Eygpt. In the 17th century it was used in Europe to make low cost architectural details, as an alternative to carved wood or plaster. It is used today to make masks or costumes for parades, as well as piñatas. As October approached, I started to think about how I would make La Luna. After some failed attempts to use chicken wire to make the form, I decided on cardboard. I cut the cardboard into crescent shapes and taped it together. 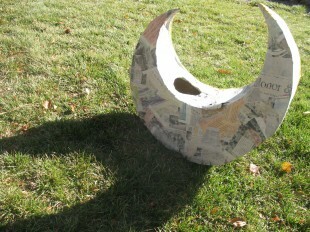 I then applied the paper mache and painted it. I think I had more fun making this costume than my daughter had wearing it. It was fun, until now…now, I had to figure out how attach this four dimensional shape to her body, Yikes! I am an artistically minded person, not a engineer. The only way I knew to figure this out was to have my daughter stand right in front of me while I guessed where to cut out a place for her arms, legs or whatever body parts might need to fit through this “costume”. After a few guesses, I was on my way to fitting this thing on her. 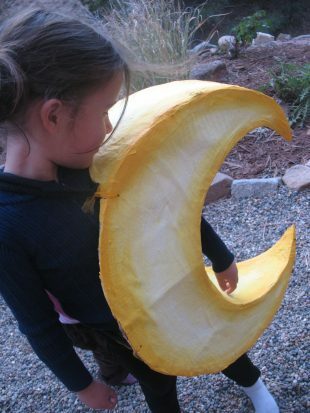 An hour and a few pieces of fabric straps later, she was actually able to be one with Her Friend, La Luna. Now the question was, would she be able to fit through the door? She was able to fit through the door and was even able to walk, with a little help from some plush padding around the shoulder. In the end, I feel honored to have been asked to interpret such an important force in our lives, La Luna, Our Friend. 3 cups water 1 1/2 cups white flour newspaper pieces torn into 6″ x 1″ strips Mix the flour and water until it is a smooth paste. Make your base form out of any rigid material. 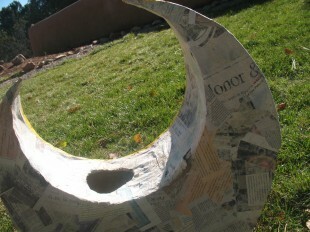 Dip the newspaper pieces into the paste and apply them smoothly to the base. Let the form dry 6-10 hours. Decorate or paint.